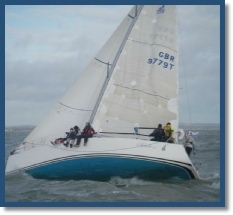 This level 3 keel boat training is an improver course allowing a sailor to be capable of manoeuvring a keelboat in a seaman like manner and making seamanship decisions in moderate conditions. Once you have obtained enough sailing experience for you to develop your sailing skills. This RYA day sailing keelboat course gives you maximum time helming and adjusting sails to help you better understand how a sailing boat works. This level 2 keel boat training provides you with the understanding and basic skills to become a confident sailor in light winds under the supervision of an instructor.